I’ve been plugging along on my abandoned playroom to office makeover, friends! Progress is actually being made and I cannot wait to share the space with you soon! 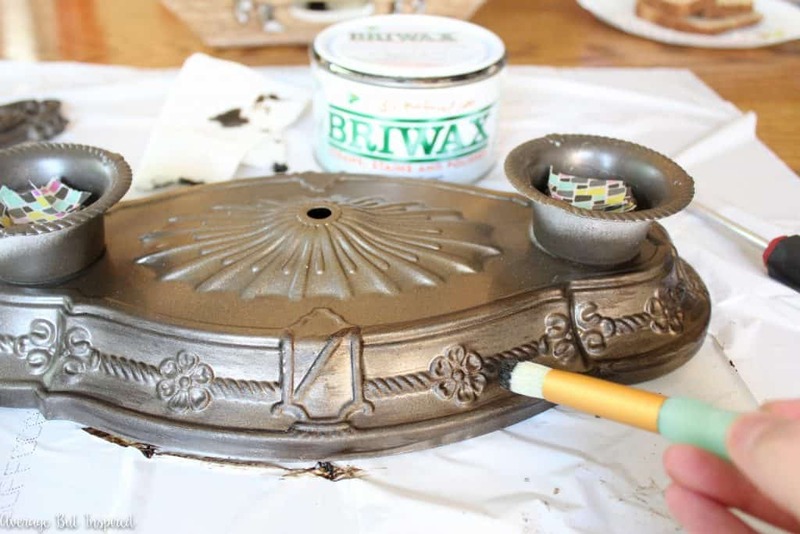 Over the weekend I crossed a big project for that space off of my list: restoring the original 1920’s light fixture to its original look with a faux antique brass finish. And you guys, it turned out WAAAAAY better than I expected! Getting this faux antique brass finish required some trial and error, but in the end it was totally worth it and pretty easy to achieve! 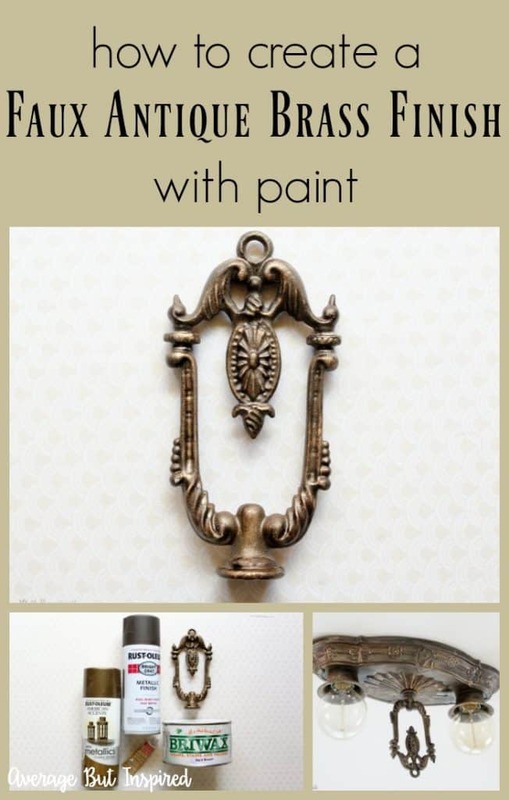 This paint technique can be replicated on so many items: furniture hardware, lamps, light fixtures, decorative accessories and more! 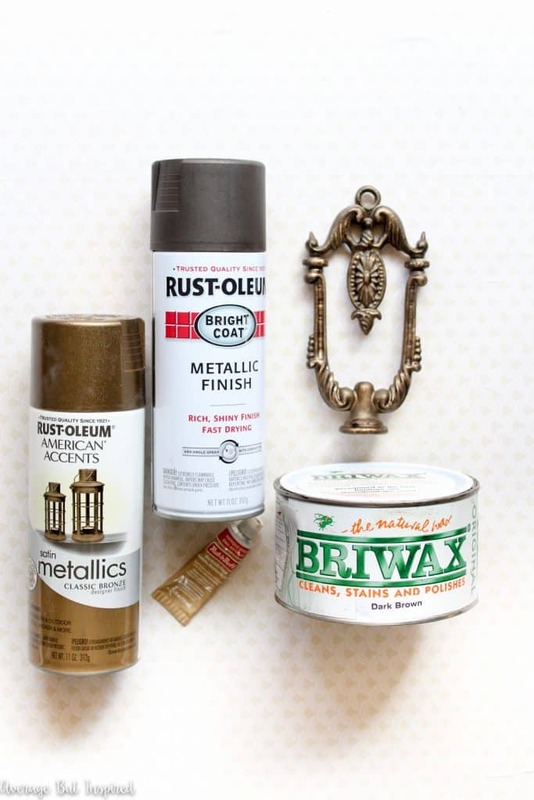 Brass is totally trendy right now, so I think you should give this technique a try! Some of these links are affiliate links, which means I earn a small commission at no added cost to you if you purchase through the links. To read my full disclosure policy, please click here. 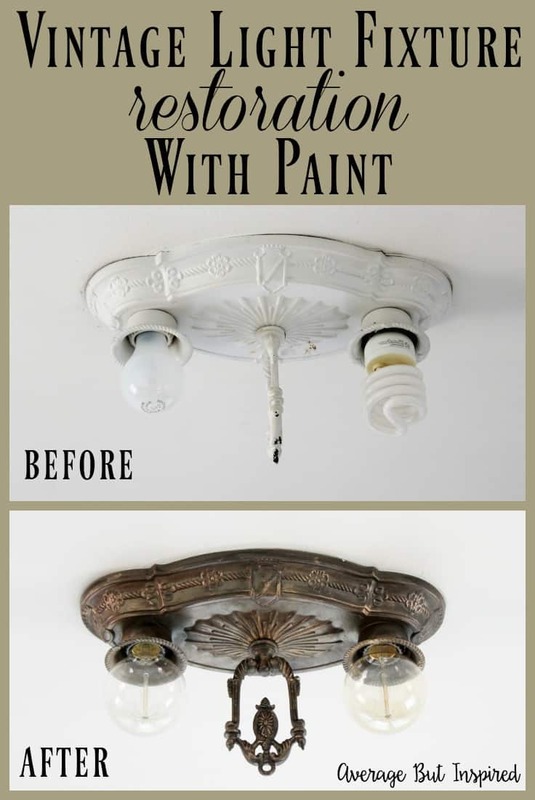 Because my husband and I want to keep as much of the original character in the house as we can, I decided that I had to try to restore this light fixture to some of its former glory. Thankfully my husband was on board, and he took the fixture down for me. Once it was safely removed from the ceiling, I brushed off the loose paint with a wire brush. Some shiny gold started to peek through. Because it was SO shiny, I don’t think that was the original color; the underneath side of the fixture was a much more muted brass. 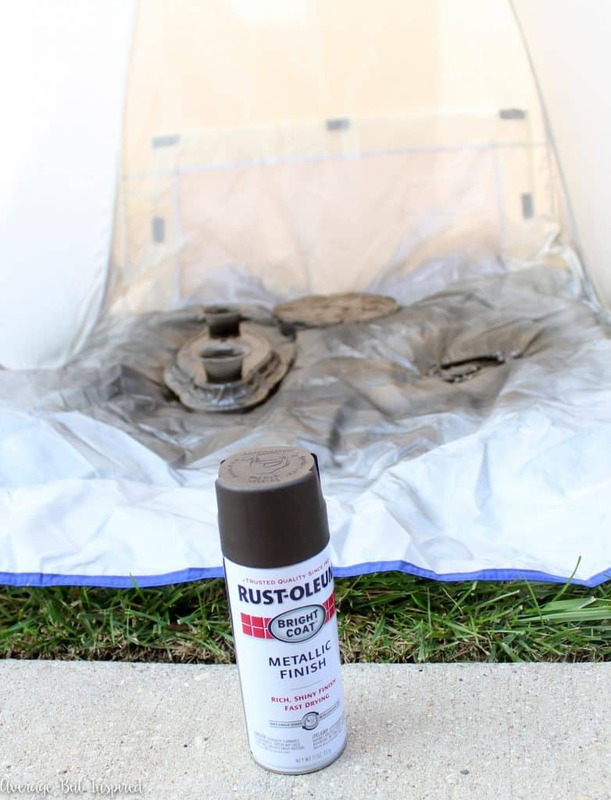 Next, I wiped it down and spray painted it with a coat of the dark bronze spray paint. 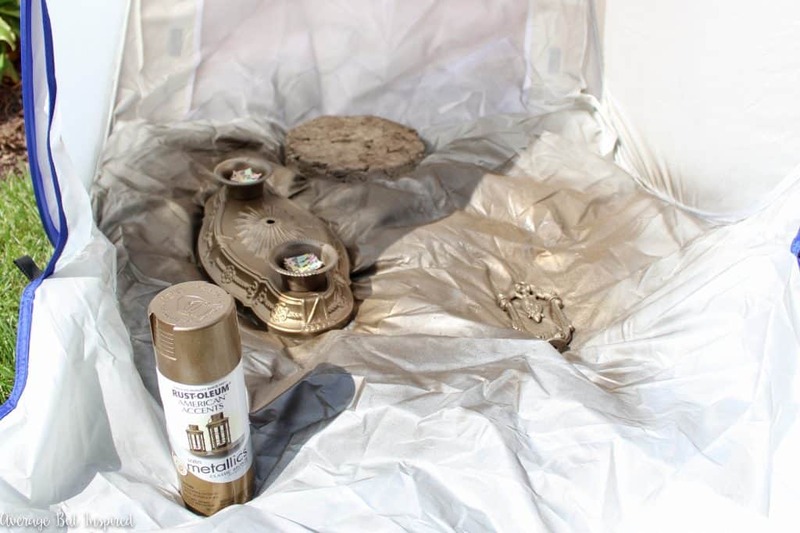 After it dried, I sprayed a coat of the classic bronze spray paint over the entire piece. I stood farther away so that I wouldn’t be spraying such a concentrated amount onto the fixture. Once the paint dried, I took the fixture inside for round two. At this point, the paint finish looked VERY spray painted. It was pretty much a solid color all over, though there were some spots where the dark bronze paint was visible underneath the shiny bronze. The finish did not look authentic at this point, however. I let the Briwax sit for about 20 minutes and then gently buffed off the excess with a clean cloth. 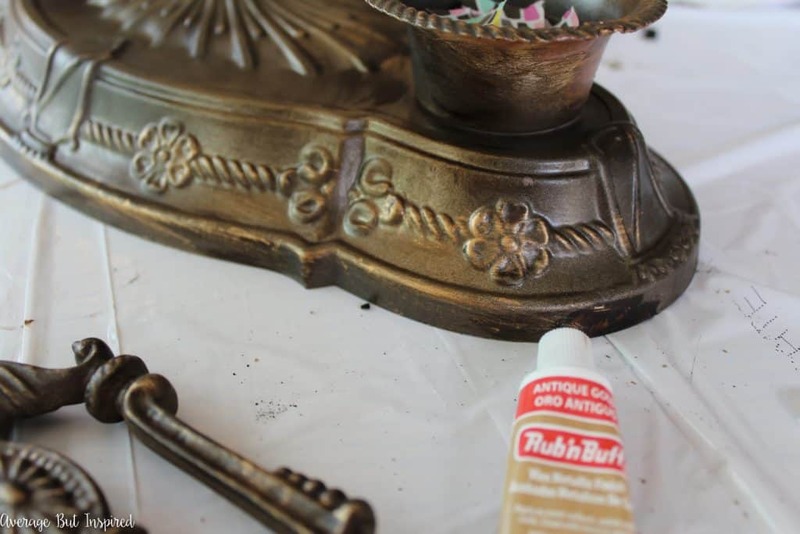 Next, I grabbed the Rub n Buff and applied some to the raised portions of the light fixture. 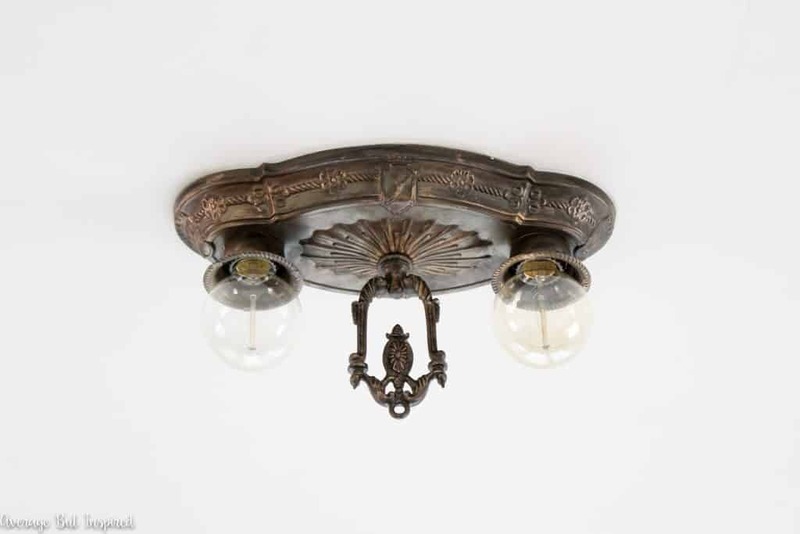 This added some awesome highlights onto the fixture, and really helped give it an authentic look! Can you believe this was white just a short time ago? 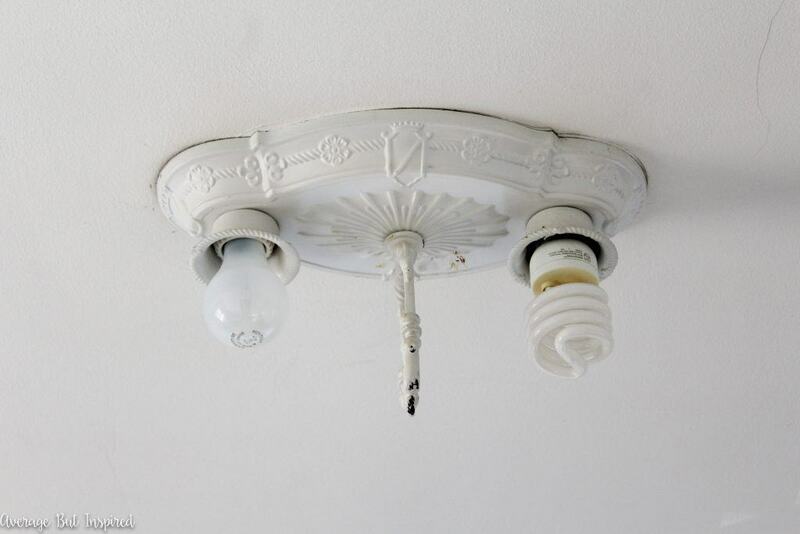 Once everything was dry, it was time to hang up my new, old light fixture! 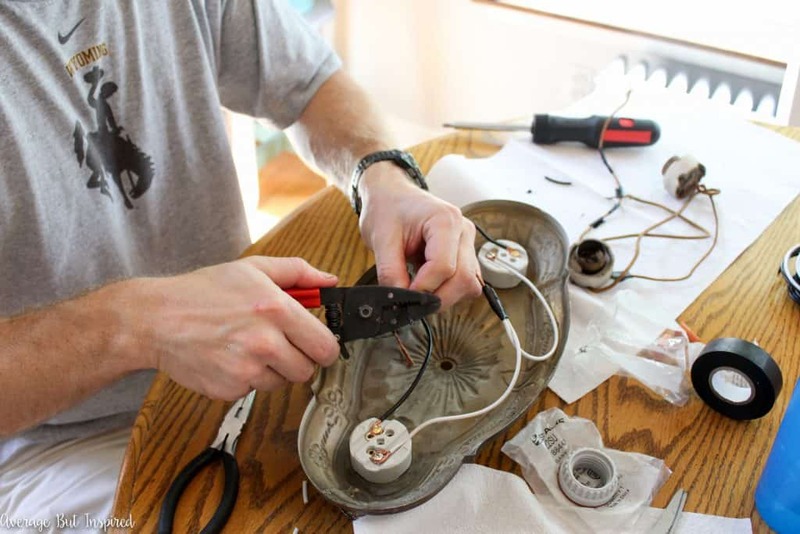 My husband was ready to get it installed when he decided that the old cloth wiring was definitely a fire hazard. 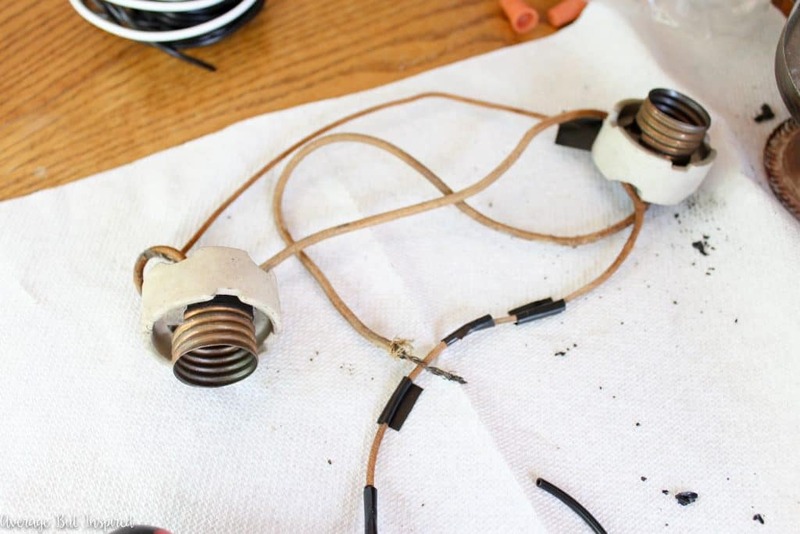 I thought that meant all of my work was for nothing, but then he surprised me with secret master electrician skills, and he re-wired the entire thing in no time! I was shocked (but not really, since I didn’t touch the wires – ha (get it? )), and I have no idea where he learned this from. He’s been holding out on me, I tell ya! 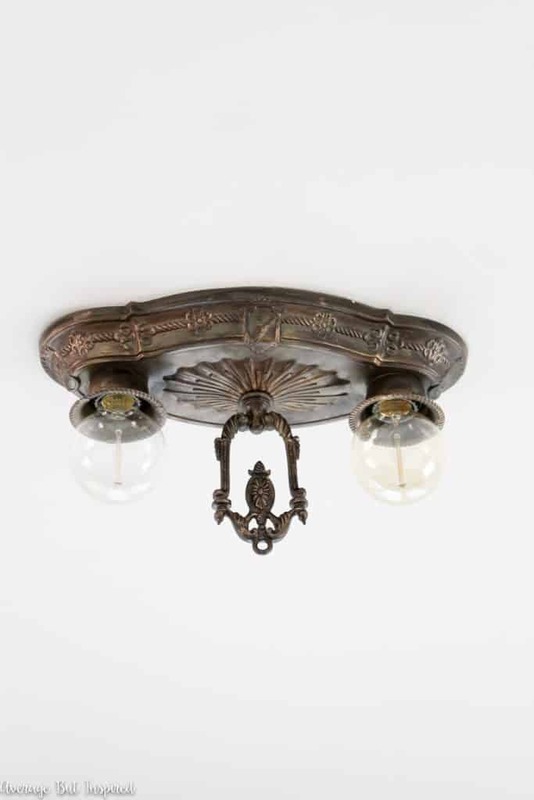 Anyway, once he worked his magic, he hung the light fixture with its faux antique brass finish in the office-in-progress, and I did a dance of happiness (and popped some cool new Edison bulbs in there)! I mean, seriously, can you even believe this is the same light fixture I showed you above?!? It looks good – doesn’t it? Stay tuned for more office-in-progress updates soon! 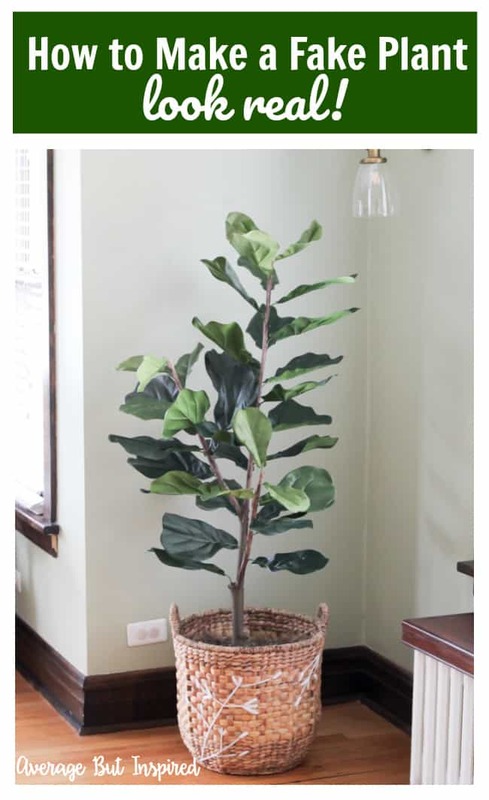 Check This Post Out To Get the TRICK for Making Fake Plants Look Real! 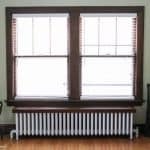 How to Paint a Radiator the Easy Way! That’s such a gorgeous and unique fixture and you really brought it to life with the new finish. It looks fantastic, Bre! You have an amazing eye and I absolutely love how you gave this gorgeous piece its dignity again. Enjoy your beautiful fixture! Those details can’t be ignored now! It looks authentic and gorgeous! OMG I have nearly identical fixtures! Mine have been painted white too!How did you know yours were from the 1920’s? I assumed mine was original to my 1920s house but wasn’t sure. Thanks for the post. I have been really struggling with what to do with these fixtures. 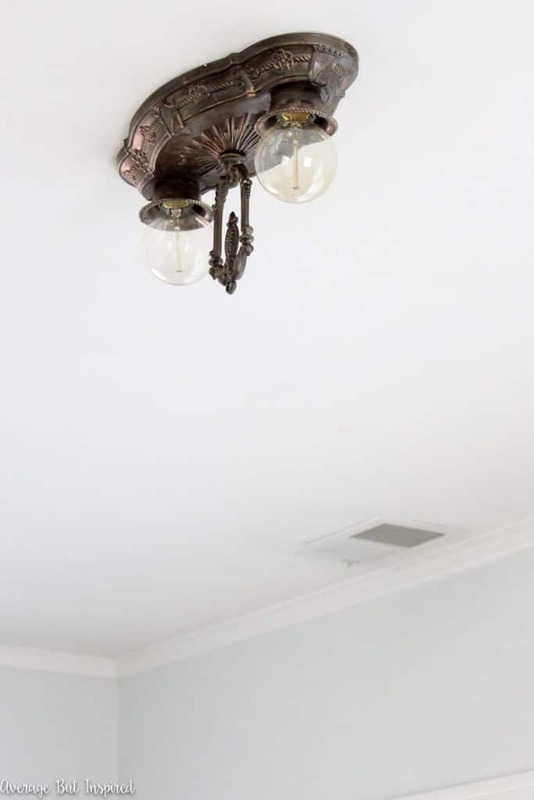 I have a 1915 house with absolutely gorgeous light fixtures throughout. The only thing I couldn’t understand is why they all had ceiling medallions except the stunning stained glass chandelier in the dining room. It made the ceiling look “naked” in my opinion. I bought one of those plastic-y foam-y medallions from a big box store. 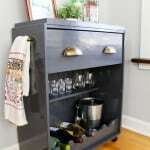 I haven’t installed it yet because I had no clue how to make it look like it had always been a part of the house…until I found your post! I’m not familiar with the briwax and rub n’ buff. I want to apply this whole technique to a metal bed frame. Would those materials rub off on the sheets do you think? 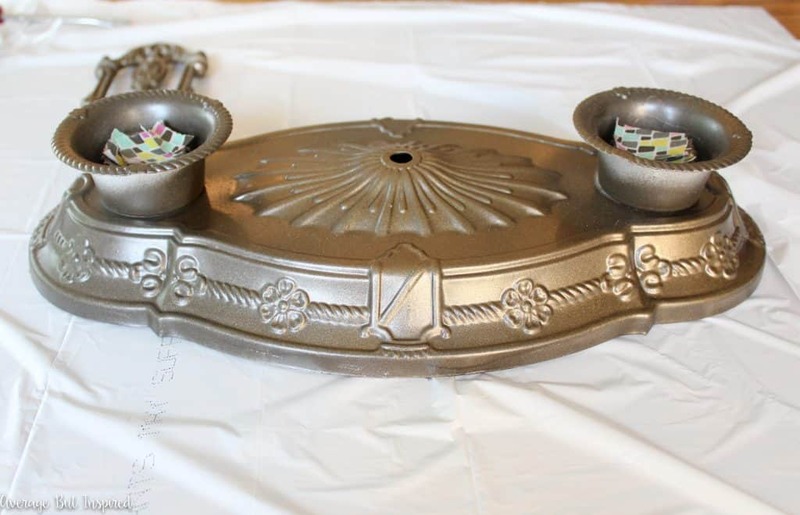 So I actually DO have some antique 20s light fixtures laying around in need of refinishing! Any recommendation for other products in place of briwax? I can’t get it locally and Amazon has been a pain about shipping stuff to Alaska lately. 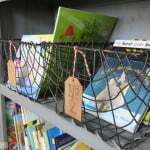 I have Lowe’s, Home Depot and Walmart to find a product at. 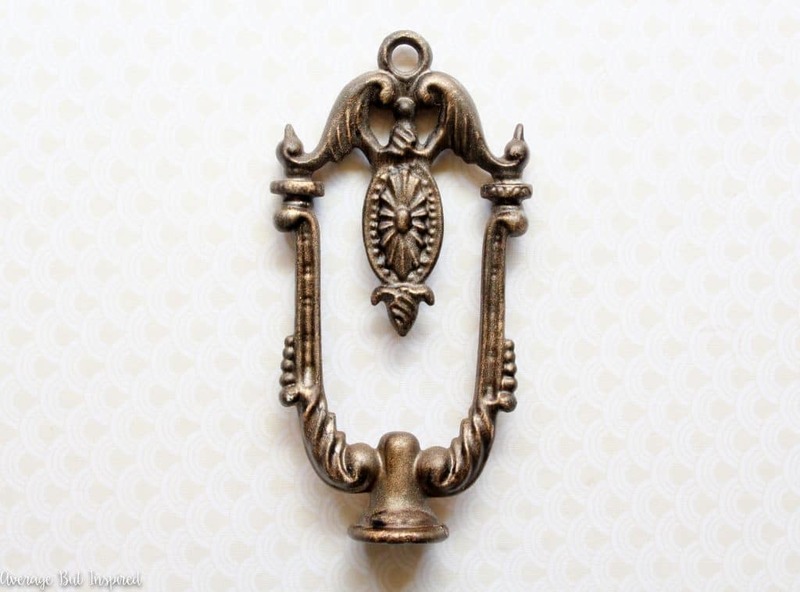 This is gorgeous and just what I needed to restore some of the fixtures I found for my Victorian house. May I ask what color BriWax you used in this project? Thanks! 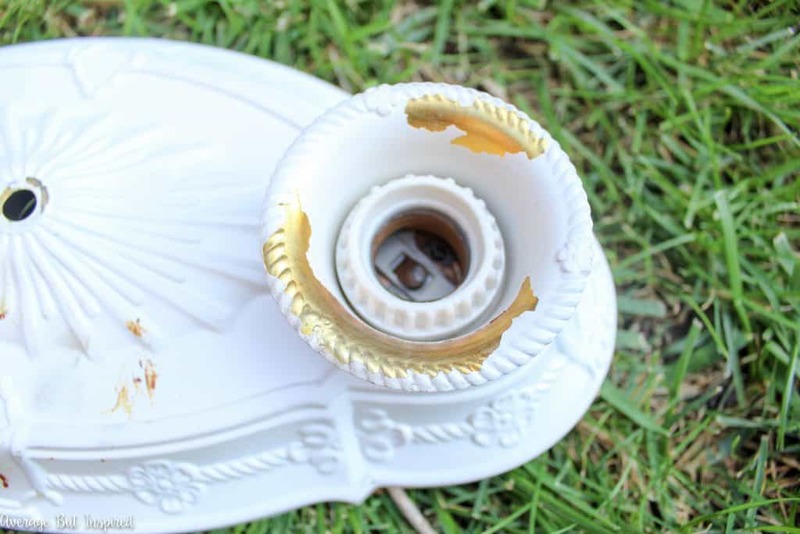 I have some whiney brass candle sticks that I want to do this to. Also to a hanging fixture to for my bedroom. Thanks for the tips.